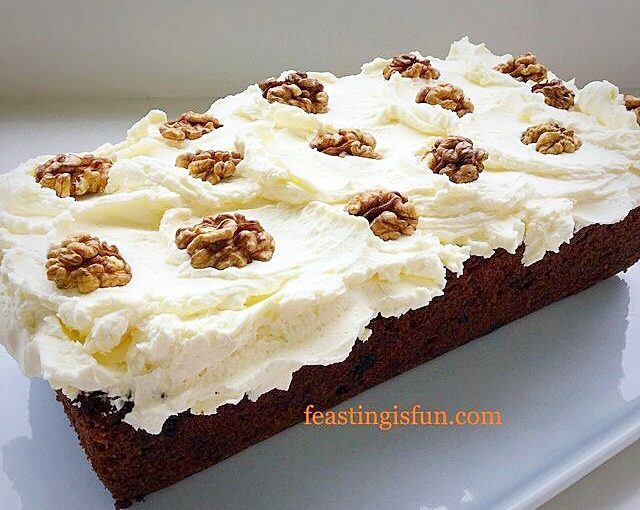 Mascarpone Topped Carrot Cake, moist, cinnamon spiced carrot cake, with added walnuts for crunch and sultanas for sweetness. Finished with a lemon scented mascarpone cream cheese and walnuts. When I crave cake, I really, really C R A V E it! First of all I rarely crave cake, maybe once or twice a year – but when I do I have to have it. Secondly, without exception it HAS to be homemade. Too often I have been let down by supermarket copies, or bakery flops. And the only way to satisfy my craving is to bake the cake myself! Yesterday, the craving hit for carrot cake. I’d been struggling with a migraine all day and wanted to snuggle under the duvet until the pain had passed. Yet during a brief respite in the afternoon I whipped up this Mascarpone Topped Carrot Cake in less than 10 minutes. Mascarpone Topped Carrot Cake beautiful simplicity. I have dozens of cookbooks and even have a Crazy Caramel Carrot Cake recipe on here, but in all honesty I didn’t have the patience to trawl through them deciding which cake to make. Because I knew the flavours I wanted to taste in my head I created the recipe as I went along. Fortunately having baked a lot of cakes I did have a rough idea of proportions. 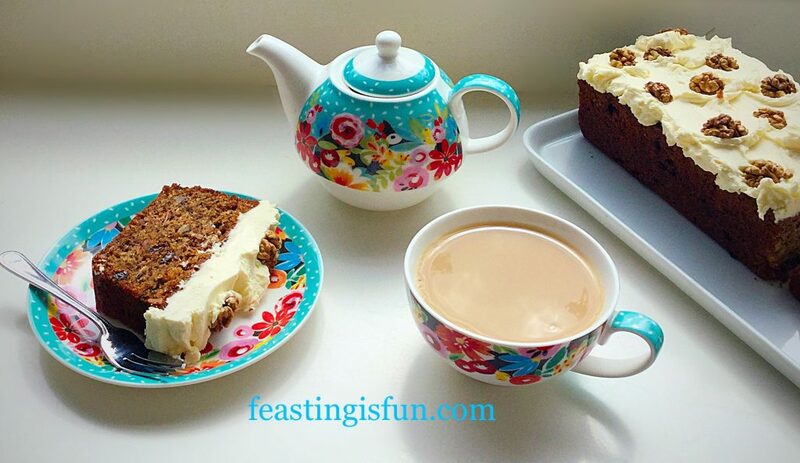 From memory I recalled baking a carrot cake with our youngest daughter, following a school recipe book method. Except all I could remember was that the recipe used oil! 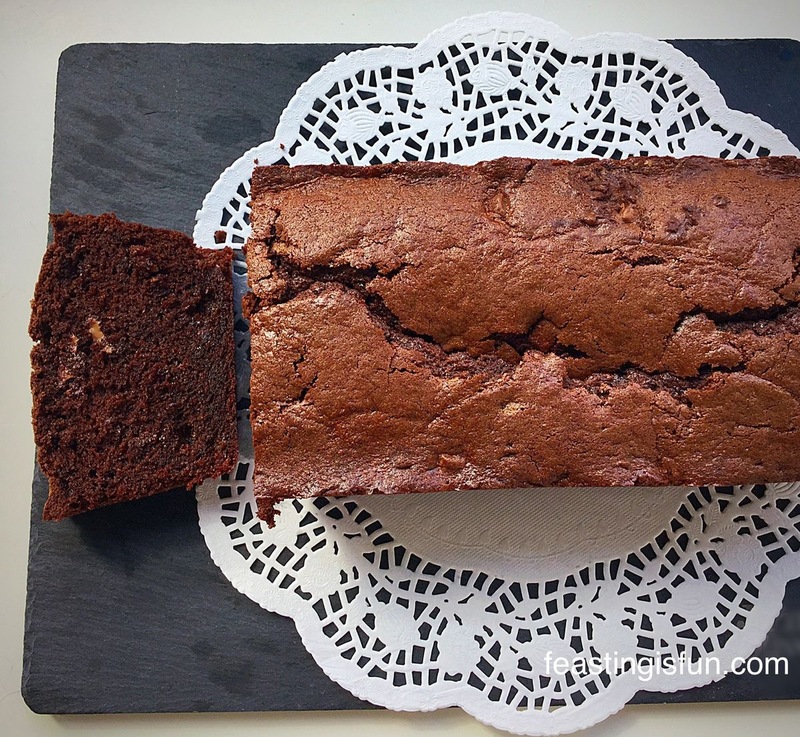 And because I love the flavour that butter imparts to a moist cake, I added both! 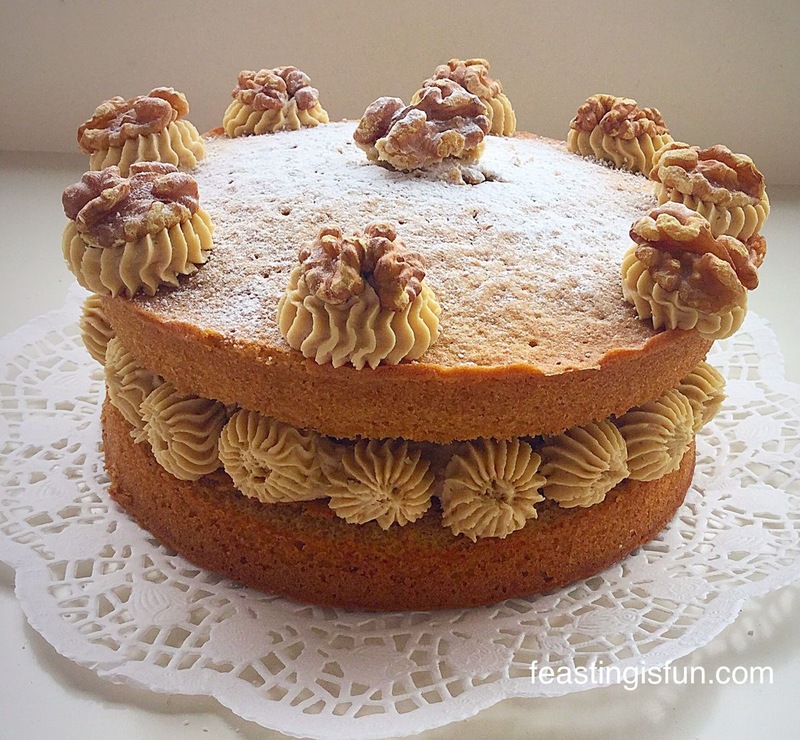 The need for walnuts, both flavour and crunchy texture was prevailent, so I made some walnut flour to boost the nutty flavour within the cake. It’s so easy, just toast the walnuts to bring out their flavour and either pulse in a food processor or use a mini chopper to achieve the desired result. Think ground almonds and you’re spot on. 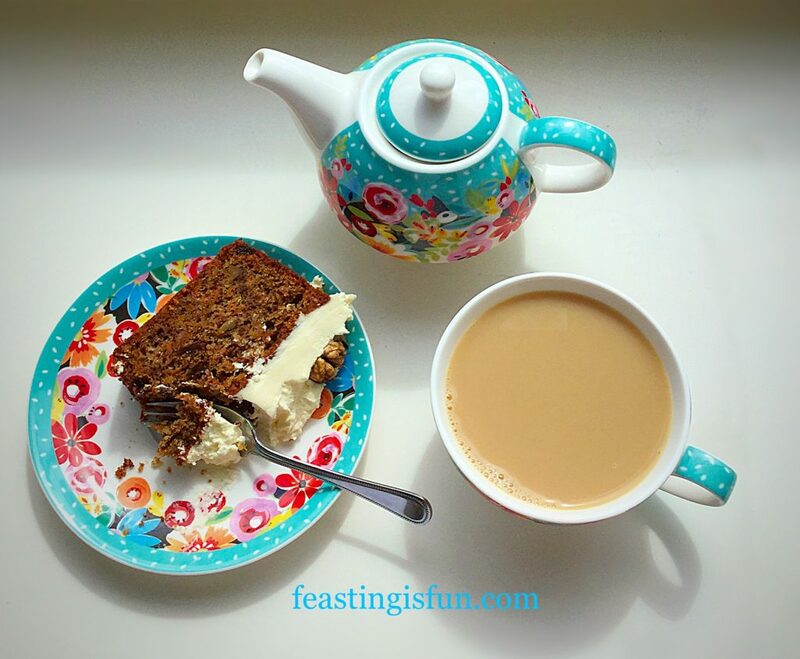 One of the big problems I find with shop bough carrot cakes is that they are simply too sweet. I’m not talking the frosting or icing, the actual cake itself. Carrots are an inherently sweet vegetable, sultanas plump up and provide natural sweetness, why dump loads of extra sugar in the recipe? Don’t get me wrong there is sugar in this cake. It is there to add sweetness in balance with the other ingredients. 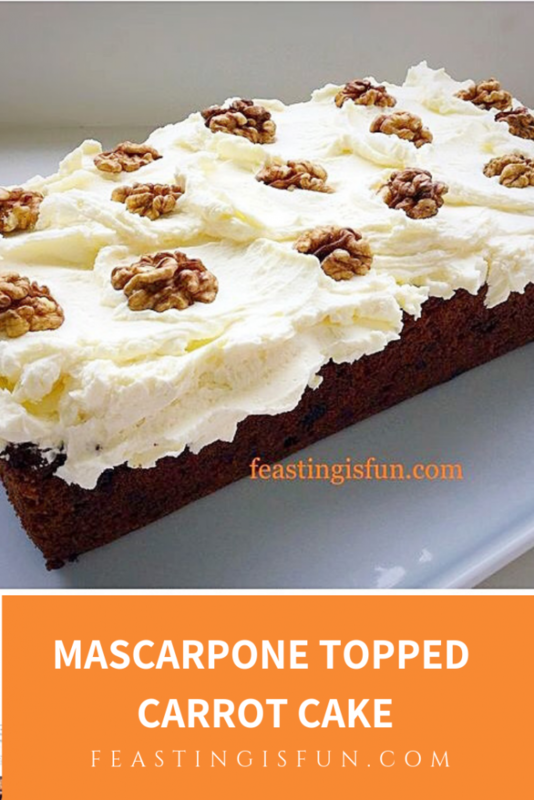 Mascarpone Topped Carrot Cake the perfect cake? 100g/4oz Unsalted Butter plus a little extra for greasing the tin. Method: Preheat the oven at 180C/160C fan, gas mark 4, 350F. Grease and line the base of loaf tin with baking parchment. Place all of the walnuts into a dry frying pan over a medium heat. Shake the pan occasionally and remove from the heat when you can smell the walnuts – approx 3-5 minutes. Tip the walnuts on to a tray so they can cool. In a large bowl add the butter and microwave on low until just melted. Add in the sunflower oil, sugar, salt and vanilla extract. Whisk for 5 minutes. Next add all 3 eggs. Continue whisking on high for a further 2 minutes. You want the liquid mixture to be very light and frothy. Prepare the 50g of walnut flour by chopping in a mini chopper, or pulsing in a food processor. Add the walnut flour, plain flour, cinnamon and baking powder to the bowl. 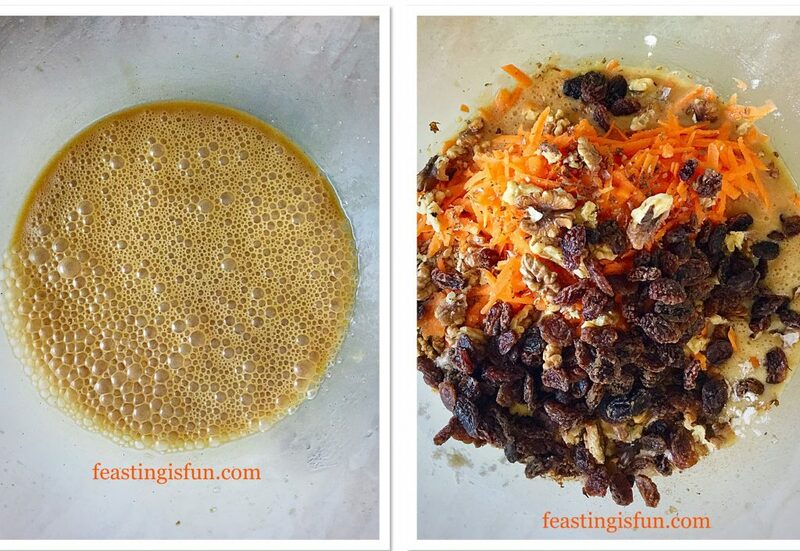 Next add the grated carrots, sultanas and 50g of walnut pieces to the bowl. Using a metal spoon fold all of the cake ingredients together until they are fully mixed, taking care not to over mix the batter. Tip the cake batter into the prepared loaf tin and smooth the top. Mascarpone Topped Carrot Cake ready for the oven. Place the cake tin in the centre of the oven and bake for approximately 1 1/2 hours, or until an inserted skewer comes out clean. 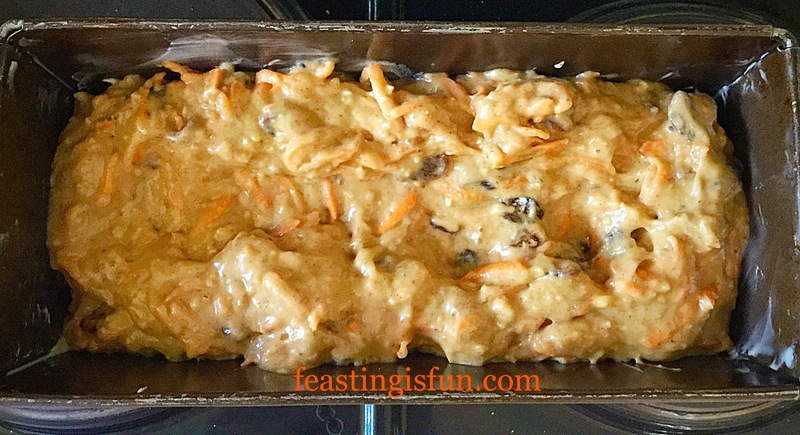 As soon as the cake is baked remove from the oven and allow to cool in the tin for 20 minutes. 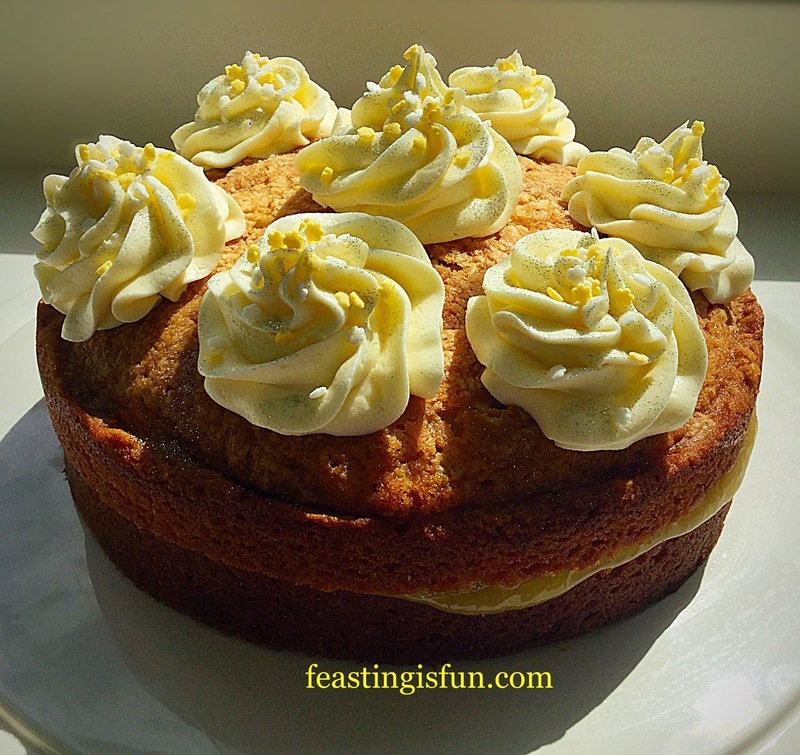 Gently go around the outside rim of the cake with a palette knife to ensure no part of the cake has stuck to the tin. Tip the cake out, removing the base layer of baking parchment and allow to fully cool on a cooling rack. Beautifully scented carrot cake cooling. In a bowl add the mascarpone cream cheese, sifted icing sugar and lemon extract (vanilla if you do not have lemon). Whisk on a high speed for 3 minutes until the mascarpone is light and fluffy. Dollop the mascarpone cheese on top of the cold carrot cake. 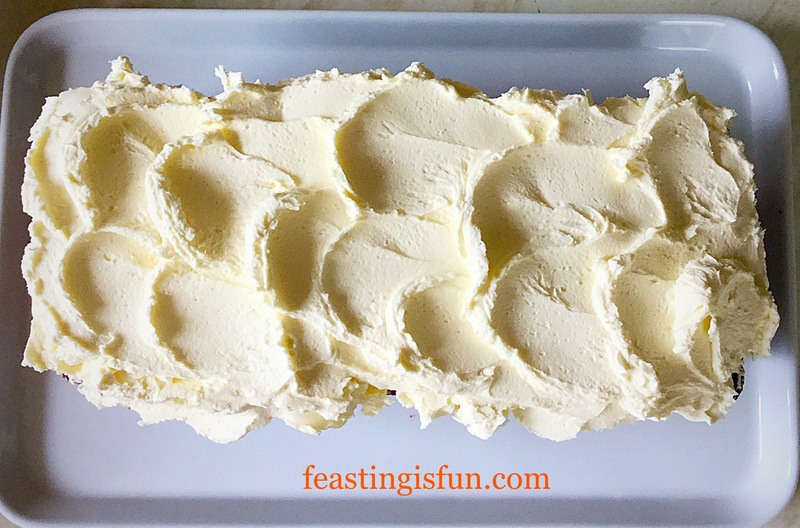 Using a palette knife spread the mascarpone so that it evenly covers the top of the cake. you can leave the topping smooth or create a pattern with the palette knife. 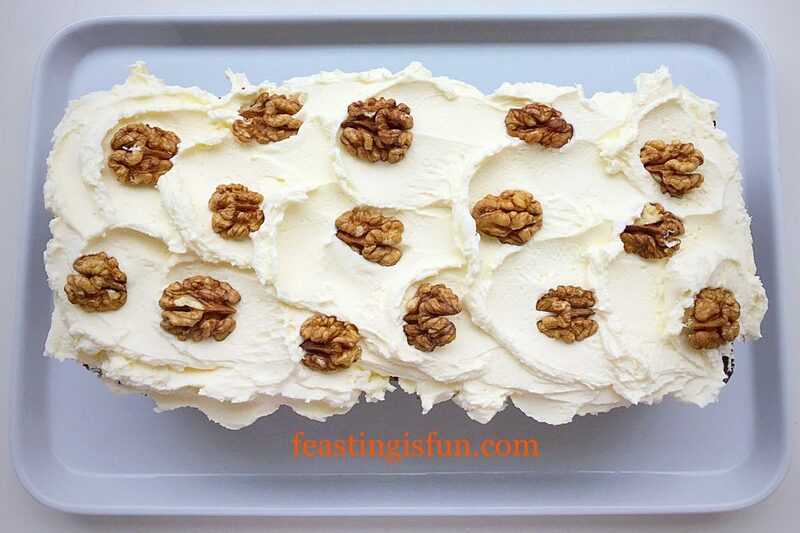 Mascarpone Topped Carrot Cake next walnuts! 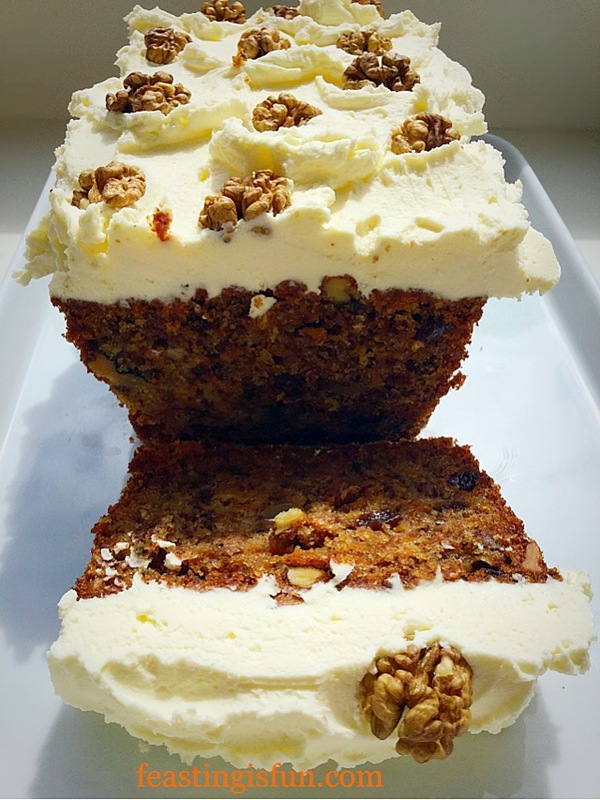 Adorn the top of the cake with the saved walnut halves and your Mascarpone Topped Carrot Cake is complete. Mascarpone Topped Carrot Cake ready to serve. My suggestion for serving, is, to chill the cake in the fridge for 30 minutes – somehow it just seems to pull the cake together as one and set it – if you can’t wait, don’t worry. Slice and enjoy with a delightful cup of afternoon tea, preferably made in a pot, it gives the leaves time to release their flavour as well as colour. 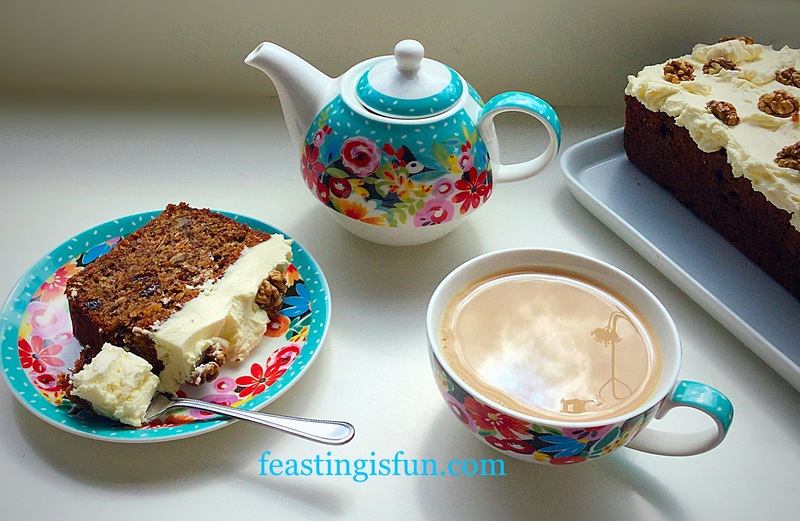 Mascarpone Topped Carrot Cake my absolute favourite. I love this pretty tea-for-one set that my hubby bought me for our anniversary. 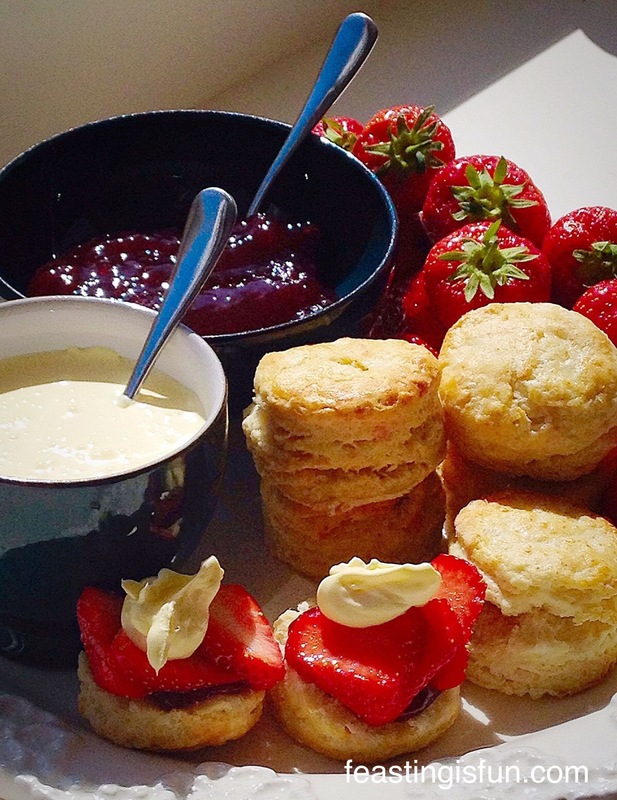 It really does turn a simple slice of cake and cup of tea into a sumptuous afternoon feast. The Mascarpone Topped Cream Cake absolutely satisfied my cravings. The tiny hint of lemon in the mascarpone is very subtle and works with the nutty, fruity, spiced cake. This may very well be one of THE very best recipes I have come up with so far! No I’m not egotistical, in fact the very opposite. So many recipes do not make it on to Feasting is Fun as they aren’t good enough. Also considering I wasn’t at my best, physically, this cake hits all the right spots. 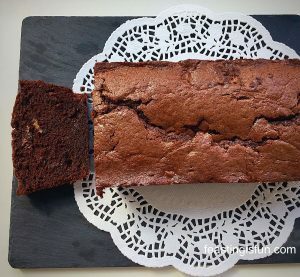 Spiced, crunchy, moist, fruity without tasting like a fruit cake. Any of these delicious cakes would make a wonderful gift to new neighbours, friends who have moved home, even bereaved families. 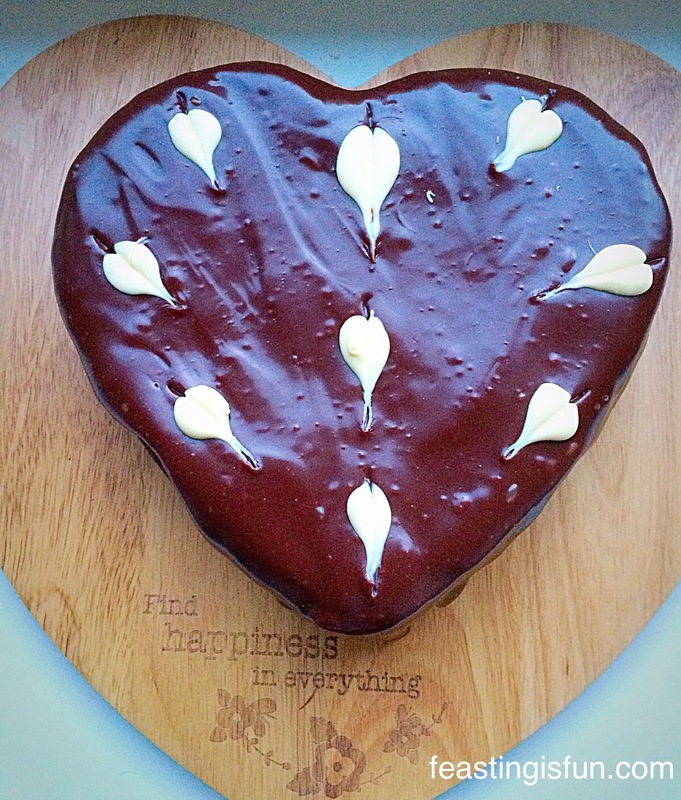 Although taking cake to those struggling with grief isn’t necessarily for them to eat. Rather it’s likely they will have endless visitors wishing to pay their respects. And a slice of cake, that someone has thoughtfully made, served with a cup of tea, may just make the visits more bearable. 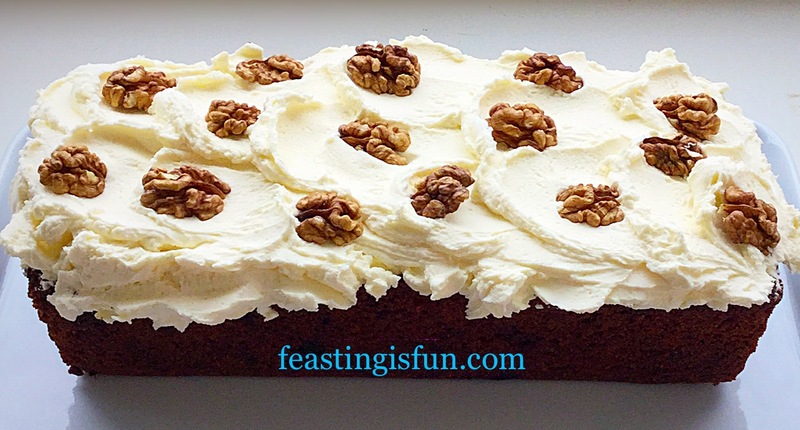 The walnuts used in this recipe come from a a very dear friend who has a walnut tree in her garden. Sadly my dearest friend passed away a few months ago. Yet making this cake, or cooking using either things she bought me, or those her family have kindly given me, has, in some way, made her passing easier. Everytime I use her cutters, cake stand, dragee balls or a myriad of other everyday kitchen items, I feel close to her. Whether it’s the memory of her laugh, tinkling across the gardens mid afternoon, or how we finished each other’s sentences. And she truly was the very best of people who lived her life to the full, despite becoming a widow at too young an age. Pat was the Green Goddess, my chief taste tester. So this post is dedicated to her and the love she had for people. Because life is not about what we do. It is not about who we love. Rather it is indeed about those whose hearts we touch. How much we are loved in return. Please see Important Stuff. Valentine’s Day is fast approaching. 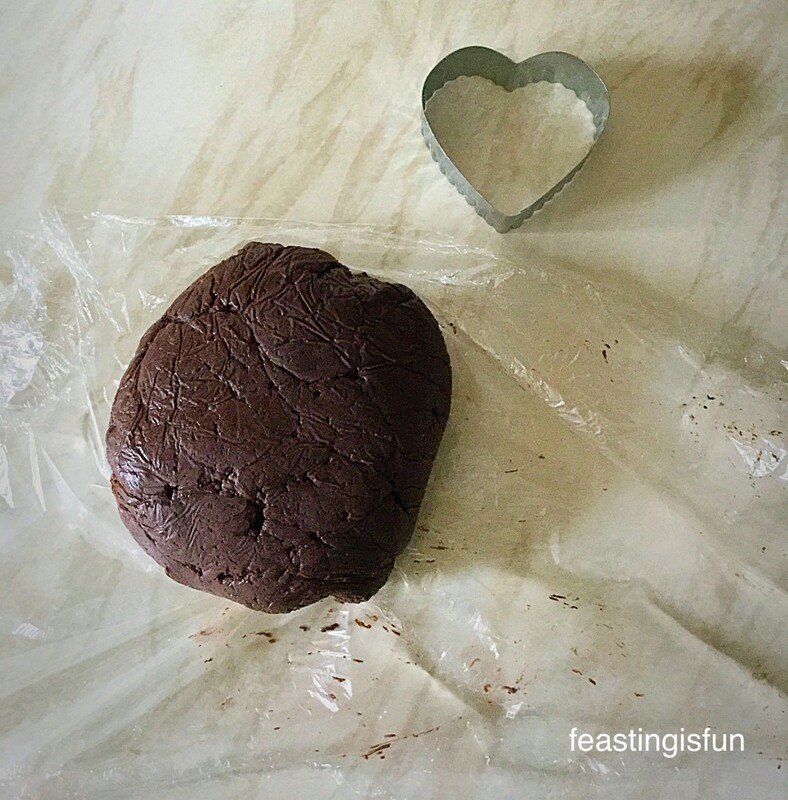 What better way to show our family and friends, how much they are loved and appreciated by baking a big batch of these Chocolate Heart Cookies. Imagine the joy and surprise on your loved one’s faces as you hand around these Chocolate Heart Cookies. Although it is nice to take one day out of the year, such as Valentine’s Day, to let people know we love them, I think it is far more important to tell those we love every day. To ‘love’ is a verb, a doing word and so the act of loving people, should be part of our daily lives. I love baking for my loved ones and seeing their faces as they bite into something delicious, that has been made by me, just for them. It shows them that they are important to me and loved very much. 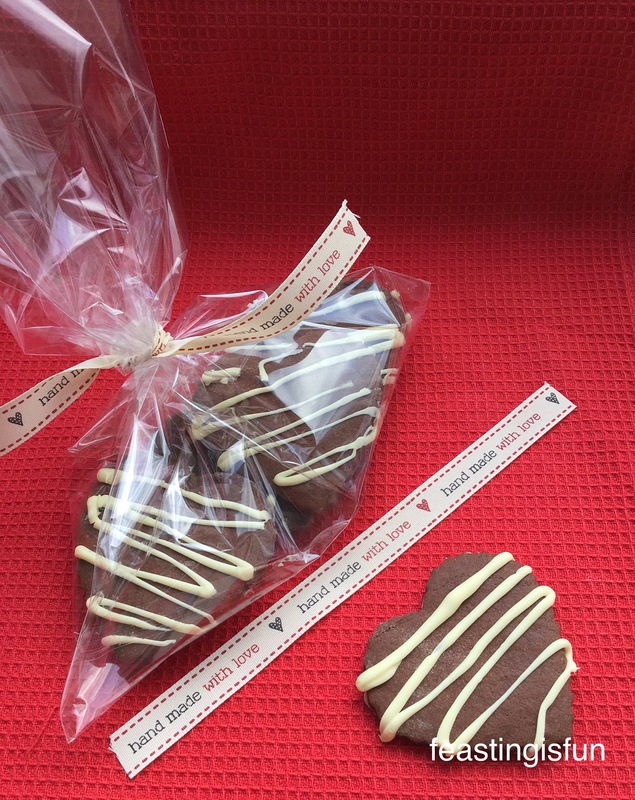 Chocolate Heart a Cookies packaged up ready for collection. 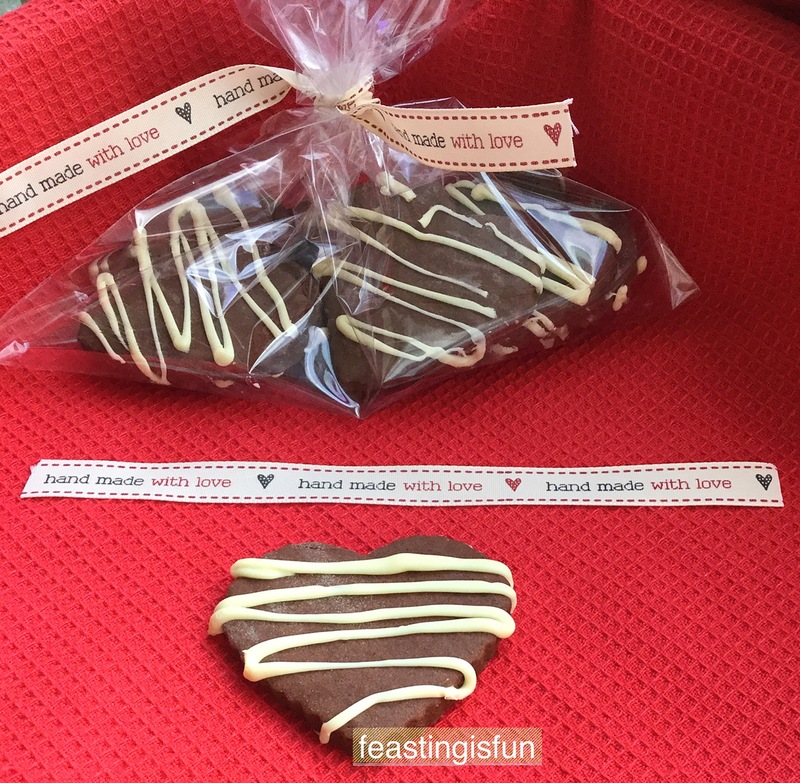 These Chocolate Heart Cookies can be made for a fraction of the cost of buying Valentine’s Day gifts and they are so personal. When they are made you make them with love. There is also this added bonus, you can make these all year round and believe me, these cookies are so utterly delicious, your loved ones will keep coming back for more!! The reason for the outstandingly, melt in the mouth flavour of these cookies, is, because they contain cream cheese. Yep, good old Philly makes a real difference to the soft, almost, truffle like, texture of the cookies and they taste amazing too! 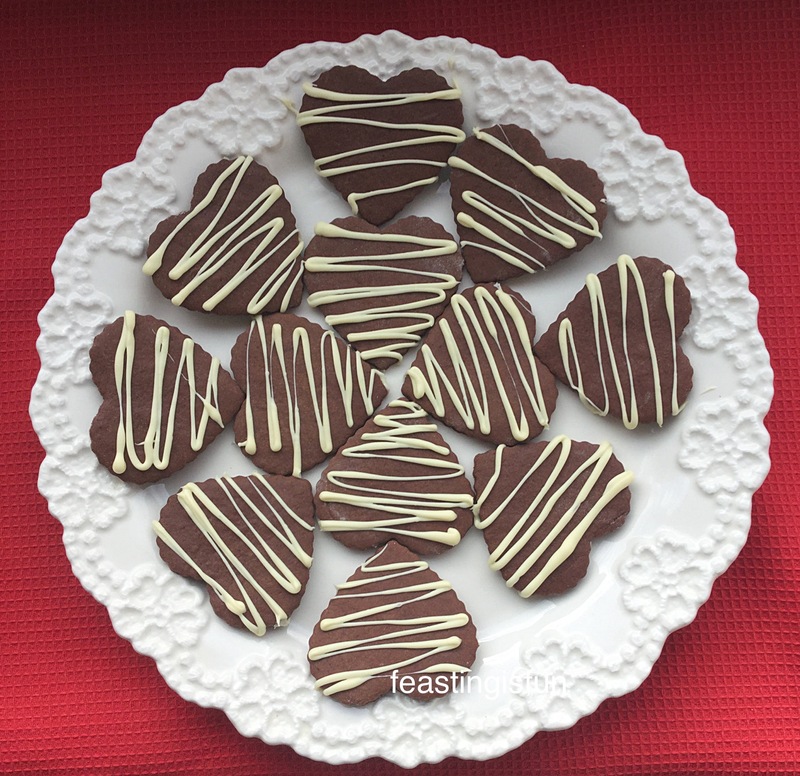 Chocolate Heart Cookies– who will you share these with? 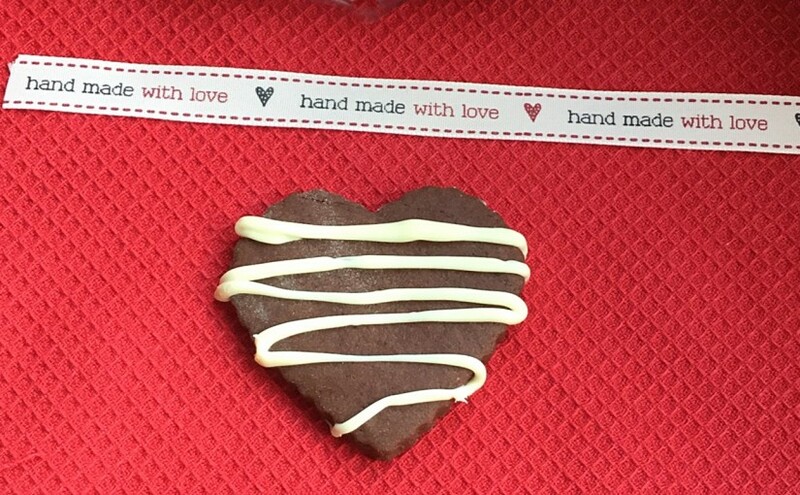 If you are going to make these cookies, it’s worth using a good quality cocoa powder, as that directly affects the chocolate flavour of these hearts. You only use 50g per batch, so it works out pretty cost effective, overall. Food Thoughts Cocoa is a great quality fair trade, organic cocoa powder. 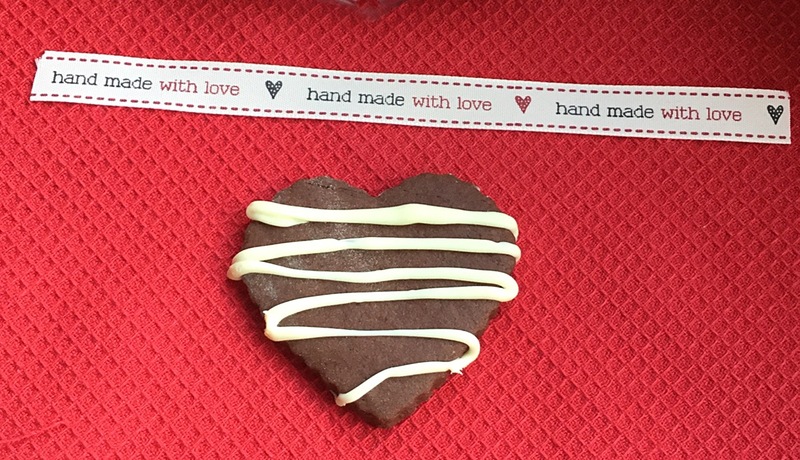 I used a fluted heart cutter and was happily surprised that each cookie kept the definition during baking. These Chocolate Heart Cookies look so pretty, packaged up and tied with ribbon. 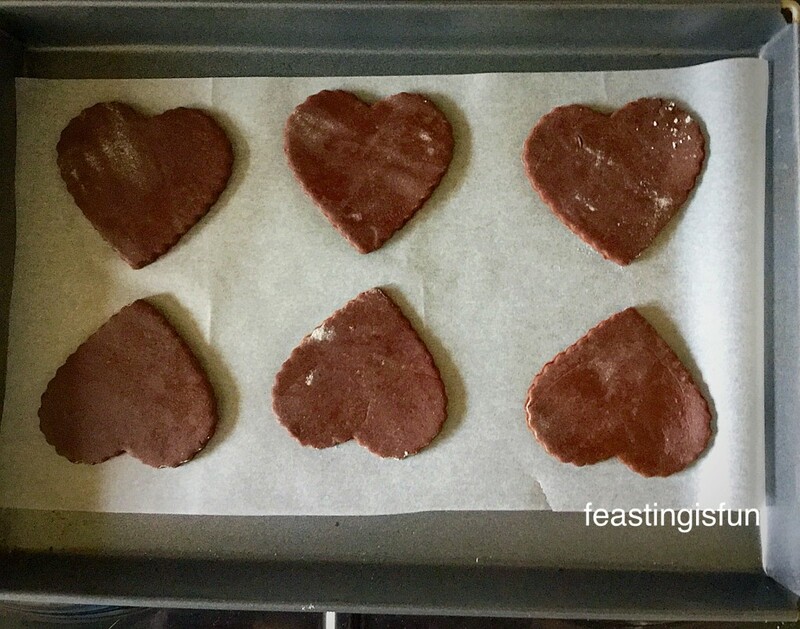 Recipe: Makes 20-30 Chocolate Heart Cookies, depending on cutter size. 100g/4oz Unsalted Butter at room temp. Add the softened cream cheese, butter, salt and sugar to a large bowl. Now add the egg yolk, vanilla and whisk in. Sift the flour and cocoa into the bowl. Mix together until uniform in colour and texture. Wipe the work surface with a clean, damp cloth. Lay cling film over the damp worktop, it will stick and not move. 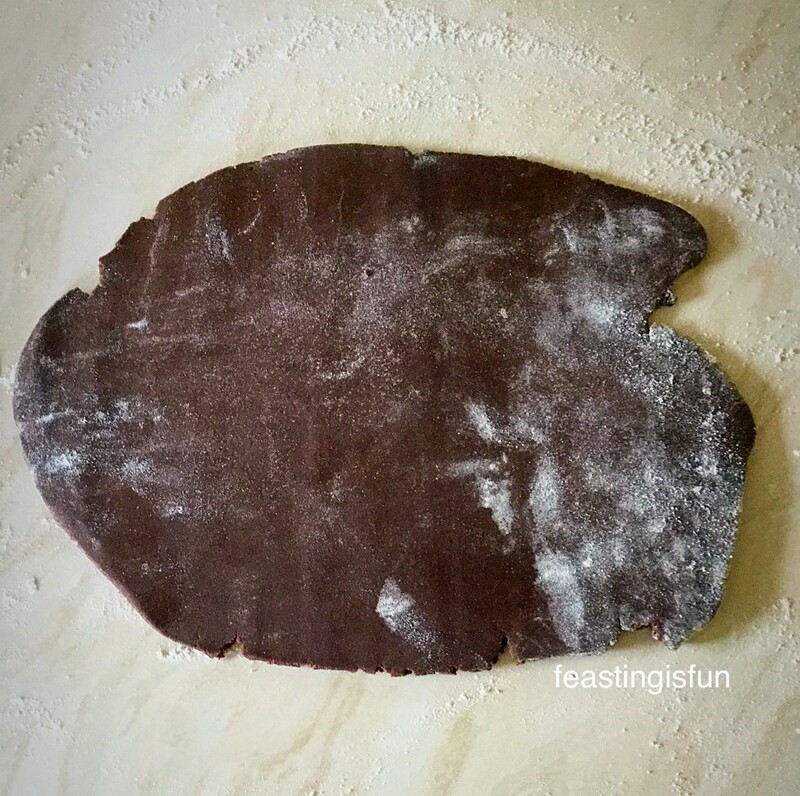 Place the cookie dough onto the cling film, form into a disc a wrap tightly. Place the wrapped cookie dough into the fridge to chill for one hour. 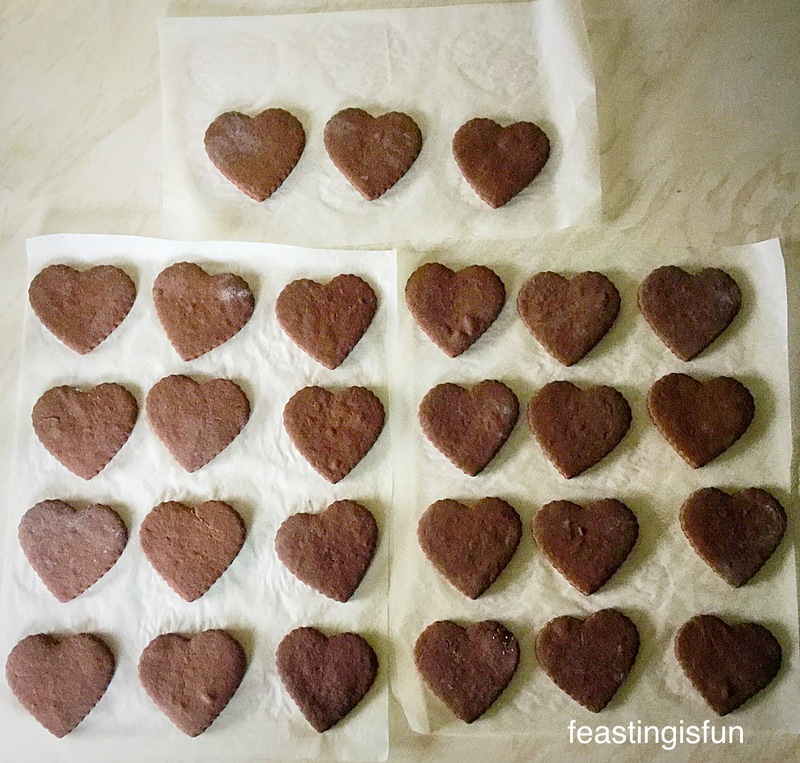 When you are ready to bake the Chocolate Heart Cookies preheat the oven to 170C/155C fan. Line 2-3 large baking trays with baking parchment. If the cookie dough has been in the fridge for more than a few hours (I made the dough on Sunday and baked on Monday), remove and leave to warm slightly for 30 minutes. This will prevent the dough from cracking. Divide the dough in two and wrap one half in the cling film. Lightly dust the worktop with flour. Roll the dough out to approx 1/4 inch thickness (6mm). Ensure you are constantly moving the dough and lightly dusting the worktop with flour – as this dough can get quite sticky. Don’t worry about a very light dusting of flour on top of the dough. 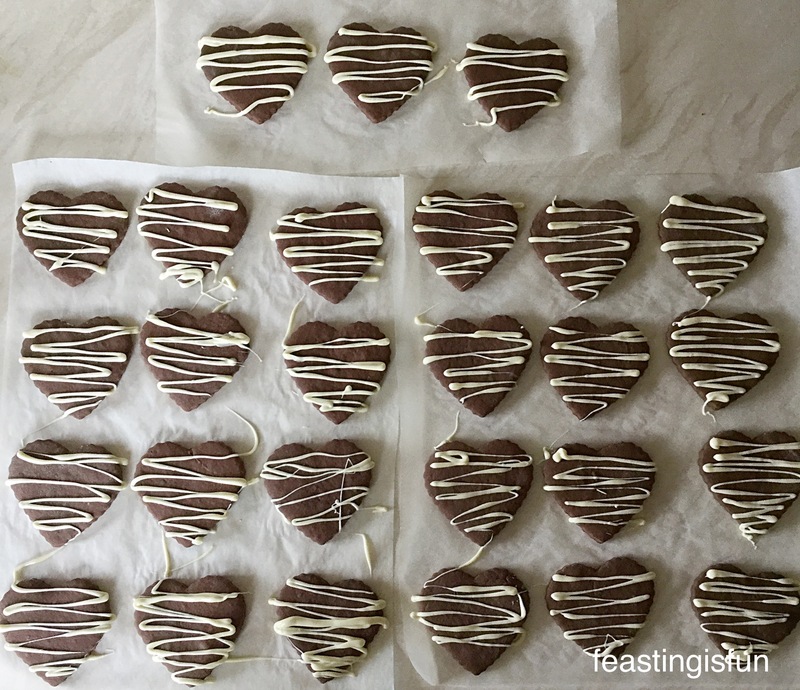 Using a 2 inch (10cm) heart cutter, cut out the cookies. Re-rolling the cookie dough so you can get the maximum number of cookies from it. Roll the second half of cookie dough and continue as before. I cut out 27 cookies. Place the cut out cookies onto the baking tray. Place the baking trays into the oven and bake for exactly 10 minutes. The cookies will have a slightly matt appearance when baked. Once baked remove the trays from the oven and allow the cookies to cool on the tray. Decorating the Chocolate Heart Cookies. When the cookies are completely cooled move them and the baking parchment to the worktop. Lay your cookies out in a uniform manner. This will make it easier to pipe the melted chocolate on. Into a heatproof and microwaveable bowl add the chopped up white chocolate. Heat on 20 second bursts – remembering that white chocolate keeps its shape when melted. Stir after ever 20 seconds and remove just before all the white chocolate has completely melted. Continue stirring until all the chocolate has melted. Spoon the warm, melted chocolate into a disposable piping bag – alternatively, using a fork you can drizzle the chocolate over the cookies. Snip the very end off of the piping bag so that there is only a small hole. Pipe a squiggle pattern over the heart cookies, I found it easier to pipe them in vertical lines without stopping, just lift the bag tip upwards, after the last heart in each line is drizzled. Pipe squiggles of white chocolate across the hearts. Allow to cool completely. This can take a little while and during hotter weather (it is Winter here now) they may need to go into the fridge to set completely. 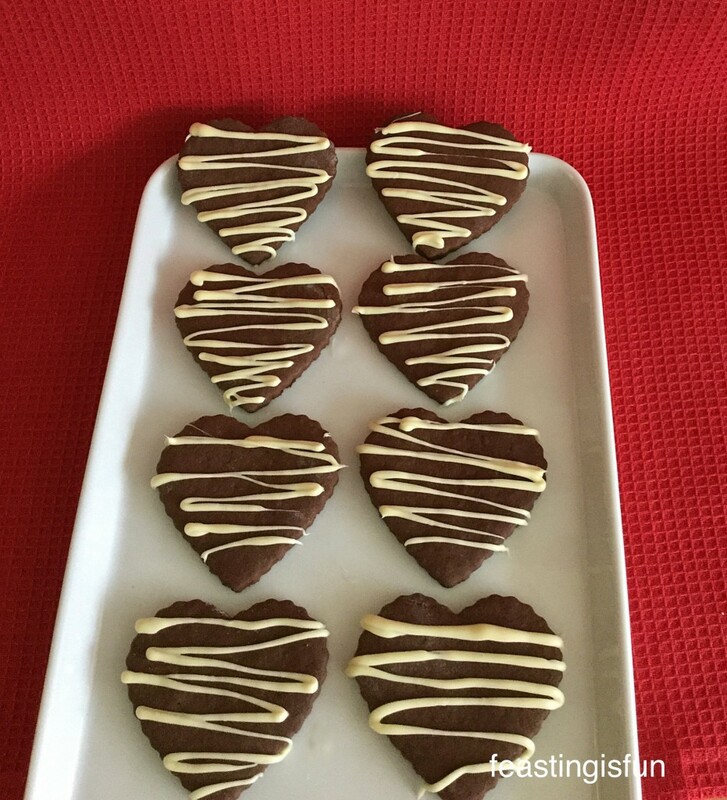 Chocolate Heart Cookies ready to be shared with your loved ones. These are the perfect ‘I Love You’ gift anytime of the year! Do you like to bake as a way of expressing love? Super Light Scones just cut them out with a heart cutter! I hope that you know you are loved, see Important Stuff.